Now seven scholas inside the M25! I have just added three more scholas to our list of affiliates and the map, by coincidence all of them are based in London. This brings the total in London to seven, which is very heartening. The St Bede's Schola at Clapham Park and the Schola of the Knights' Chapel at St John's Wood (the chapel of the Order of Malta at the Hospital of SS John & Lizzie) have been on the map from the beginning; they were quickly joined by the LMS London Schola, an ad hoc group whose membership overlaps with the previous two but sings at Corpus Christi Maiden Lane and elswhere, and the choir of Our Lady of the Rosary, Blackfen, the church of Fr Tim Finigan. I have just added St Mary's Latin Mass Choir, which boasts a website, and two very exciting initiatives of Jennifer Smith of the Royal College of Music. One is a Chant workshop at Ealing Abbey, whose participants form a schola for special occasions at the Abbey. The other is an official 'chamber group' at the RCM itself, which is working towards singing liturgically at nearby churches. There are now 28 choirs and scholas on our map, which covers England, Wales and Scotland - including the Orkney Schola. I am waiting to hear back from two more groups in the South West who should bring the total to 30; if you have a group please let us know! As with all the groups listed on this site, if their details aren't available on the web email us and we will forward the message to the organisers and put you in touch. More Canterbury Gregorian Music Society events! We have been asked to run the little service commemorating St. Mildred which we did last year. It is very short, beginning with the Angelus at the traditional midday hour. This event forms part of the Parish festivities celebrating St. Mildred close to her feast day. We will have a short practice at 11.30 at Greyfriars and then sing the service. It would be most helpful if you could let me know of your intention to come along, just so I bring sufficient copies and know I will not be singing solo. 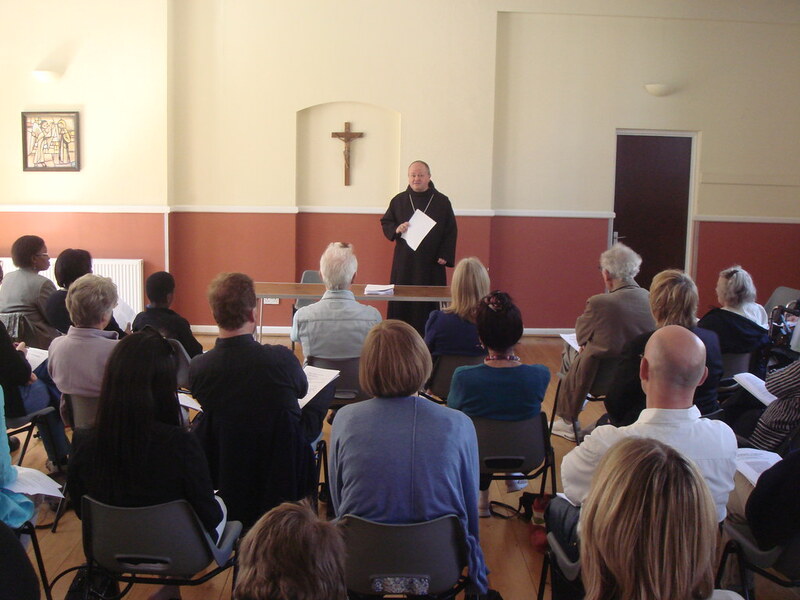 The World Community for Christian Meditation is holding its annual seminar in Canterbury this year at Kent University. They are keen for us to provide some appropriate music during their proceedings. They have asked us to sing Compline on the Friday and Saturday evenings of their seminar. This would be exactly the same chants as St. Anselm’s Compline which we did in the Cathedral last year. I will be running a workshop at 2-3pm on the afternoon of Friday 6th August for the Seminar participants who wish to learn the music. If anyone else wanted to join in this, I’m sure it would be possible. Other than that, we will have a quick reminder session at 9pm on the Friday and Saturday prior to the service. I have not yet got the exact location for the afternoon practice and the venue for the Compline itself. I’ll make sure I get that crucial information to those who express interest in coming along. As our Committee Members, including me, are away for various holidays during July, you might experience a small delay in reply to postal or email communications. This will be our third visit to the Benedictine Community at Minster. Our afternoon will consist of a talk and two workshops separated by a nice afternoon tea. Mother Nikola will start the proceedings with a brief talk about the form and use of the Alleluia and Gospel Acclamation. For the first singing session we will be in one group and we will sing through simple versions of Alleluias and Gospel Acclamations, both in Latin and English. After our tea, the group will split into two. One group will be able to explore some of the more elaborate Alleluias and Gospel Acclamations. This will probably appeal to those with some experience of singing chant. The other group will rehearse selected passages to join in Vespers with the Community at 17.30. This group will be geared towards less-experienced people or beginners. Cost £5 members, £10.00 non-members – includes music and afternoon tea. For the avoidance of doubt, on this particular Saturday, Vespers is at 17.30 not the usual 18.00. REPLY SLIP - VESPERS AT MINSTER. To reserve a place please return this form (with payment) to the address below before 23rd July. Saturday 16 October 2010, Our Lady of Lourdes, Wanstead: RSCM Chant Day (RC Diocese of Brentwood and Anglican Diocese of Chelmsford), (Gregorian Chant for Advent and Christmas). There are two more workshops at Our Lady and St Peter, Leatherhead scheduled for the autumn and spring, one for clergy and one for laity – dates are yet to be confirmed. 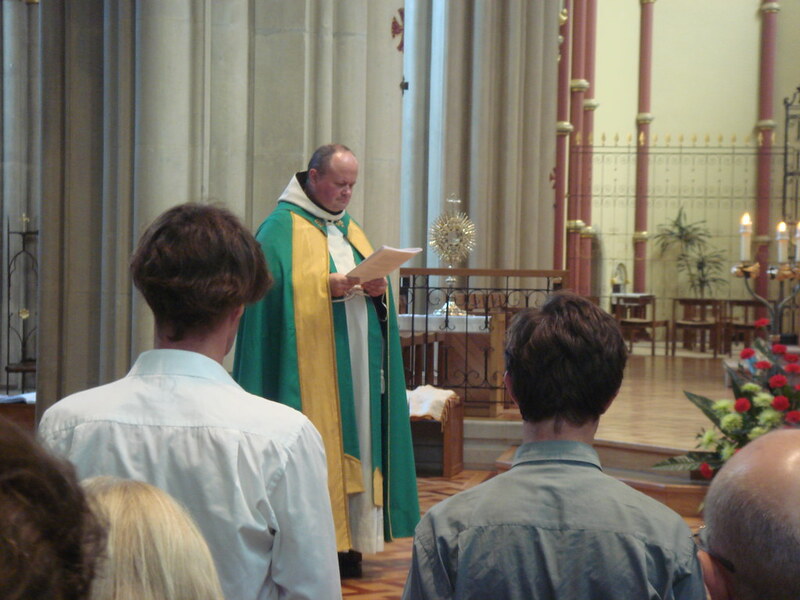 On Saturday 12 June 2010, a group of 50 people participated in a Gregorian Chant Workshop in St John’s Cathedral Portsmouth. 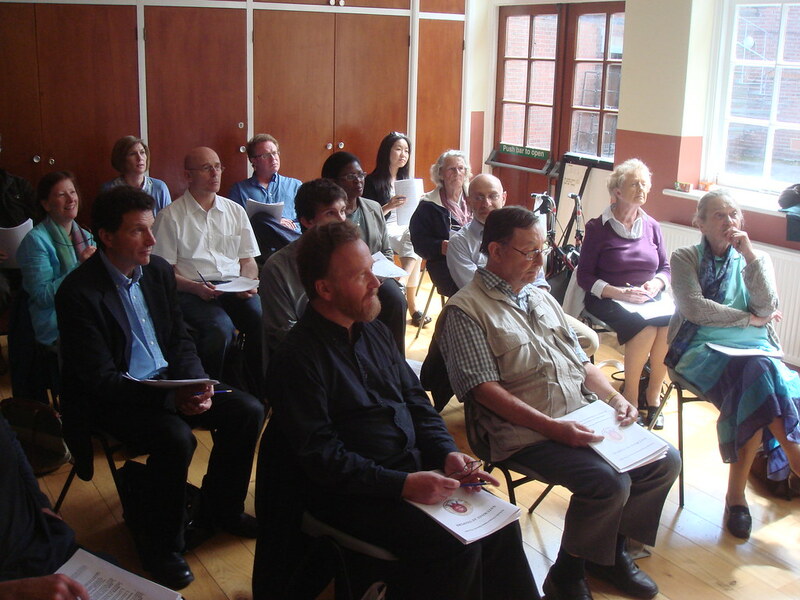 The aim of the Workshop was to give a practical introduction to the Chant for those with little or no experience, as well as helping those with some ability to develop their skills at singing the Chant. ‘It was a terrific turnout,’ said organiser Neville McNally. ‘Far more people enrolled than we imagined. There was a wide range of ages too, from 11 years to 80.’ Some people had travelled great distances and had set out at 5am in order to catch trains to Portsmouth. A lady called Rose from Devon, who considered herself to be a complete beginner, said that the day was a superb experience and hopes that another Workshop will be organised soon. The instruction was provided by 2 inspirational teachers and experienced practitioners of the Chant, Dom Cuthbert Brogan OSB, Abbot of St Michael’s Abbey Farnborough, and Christopher Hodkinson, a musicologist from Cambridge and a Director of the Schola Gregoriana of Cambridge. 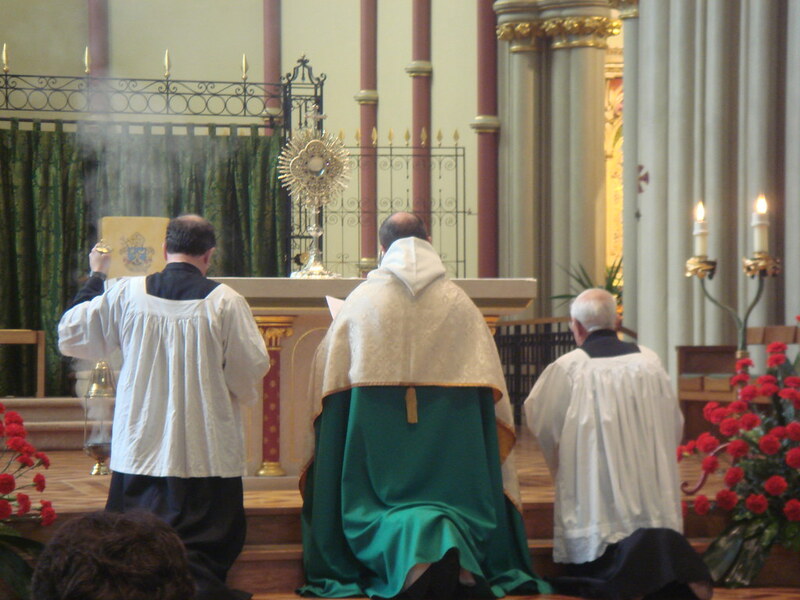 The day concluded with Vespers and Benediction which were sung in the Cathedral by all those who had participated in the workshop. The event was organised in association with the Gregorian Chant Network by members of a male-voice chant choir called the Schola Gregoriana Sancti Nicolai which is based in Portsmouth.